The PyStar program is a workshop designed to teach all women (including trans women) and their friends who are looking to learn how to program in a friendly non-alpha-geek environment. The material on this site originally incorporated material developed by the Boston Python Workshop, which was held March 4/5, 2011. Currently events decide and develop their own curriculum and badges using a mix of what’s on this site and their own preferences. As this project continues hopefully this site will keep having more teaching materials added for a variety of skill levels. If you would like to hold a PyStar workshop in your area using this material, please get in touch by joining our google group. Also if you have organized an event and have material you’d like to submit to help other organizers please fork the repo and do a pull request or ask to become a collaborator via the google group. You’re invited to a special project night on February 19 from 6-9pm at Devnuts. We’ll be partnering with Code for America Brigade to learn about building civic apps with open data. This event is for women and their friends. Beginners are very welcome. Register here. Join us for our January project night from 6-9pm at Azavea. Beginners are welcome. Register here. Join us for our November project night from 6-9pm at Azavea. 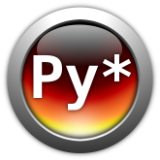 Work on Python projects, get programming help, work through tutorials, help others, hang out with other Pythonistas, and have fun. Instructors from our Python workshop will be available to answer questions. Register here. Julython in Philly! We’ve organized a series of events to help new Pythonistas practice Python, learn open source tools, and rack up points in the Julython competition. More information here. Introduction to Python workshop for women and their friends. Join us for this 1.5 day workshop on June 22-23 at Drexel University. More information here. Follow @PyStarPhilly and @PhillyPUG on Twitter for updates. follow @Pystar_Promo on Twitter for updates. Last updated on Jan 17, 2013. Created using Sphinx 1.1.3.